As one rebuilds any motorcycle (I call it "bonding"), his or her interest in the history of the machine should increase as well. 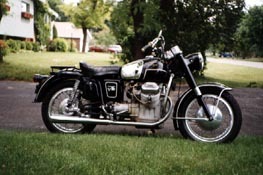 Such was the case in 1996 after I purchased my first Moto Guzzi motorcycle, a 1969 Ambassador. When I bought the bike, I knew little of the name, let alone the different models. My desire was to acquire an older motorcycle, fix it up and reacquaint myself with riding. Initially I wasn't sure what I wanted, but my thoughts were of something unique...possibly something British. I was soon to see the error of my ways. My interest in Moto Guzzi was sparked one day when I spied a beautifully restored red Eldorado with white fenders, resting among unfinished projects in a dark and dingy shop. The sharp contrast between tired, old, broken-down motorcycles and the seductive lines of this impeccably restored machine impassioned me to search for such a bike. The hunt for a Moto Guzzi was on. Eventually I was rewarded with an unfinished restoration project. The 1969 Ambassador (a 750cc predecessor of the 850cc Eldorado I had seen in the shop) was exactly what I was looking for. Since my main interest was to have something older and unique that I could ride, my first objective was to get the bike running and on the road. Though I knew it was Italian, I wasn't aware of the company's long history or anything about available color schemes in 1969 (My bike came with primed fenders and tank. ), nor did I really care. I simply wanted to ride again. However, over the past four years of "bonding," my interest in the brand has grown. As I have progressed along with the bike, I have come to learn much about my beloved Ambo, the marque, and the other people who ride Moto Guzzi. Although much could be written of my experiences over the past few years, this article is concerned with what I have learned about my "Rare Bird," a 1969 "preproduction" Ambassador - one with the letter "A" preceding the 5-digit serial number. I call this series of Moto Guzzi the "A-series" Ambassador. I first became intrigued with the history of my bike while visiting a local shop. The owner, more interested in Ducatis than Guzzis, still had considerable knowledge of the latter. He mentioned that he had a book of Guzzi serial numbers. Looking into it, I was surprised that the letter "A" did not prefix any of the Ambassadors. Knowing that my bike was indeed a complete Ambo, since the same serial number was stamped into the steering head and the engine case, I began to ask questions. I inquired as to the origin of and the reasons behind the "A" in the serial number. Through the Moto Guzzi Correspondents List (MGCL), an Internet mailing list with over 800 members around the world, brought speculation. Apparently the "A" was the company's way if identifying this series as "Ambassador." My inquiries also lead to four other Ambo owners with the rare "A" in front of the five-digit serial number. It was one of these owners, Scott Larson, who appropriately coined the name "Rare Bird" to describe this series of bike. We discovered that all of these serial numbers are in the 12xxx range. Bikes with serial numbers 13xxx and above lack the "A," and to date I have yet to find anyone with a machine with serial numbers 10xxx or 11xxx. I wonder if they were ever used. The first Ambassadors were introduced in 1969, after the company felt they needed to increase the power in their very successful 700cc V700 model, introduced in 1967. The new series was basically a V700 with bigger cylinders, but little else. Bore was increased from 80mm to 83mm while the stroke remained the same. The heads remained the same, with the smaller valves being operated by one spring (as opposed to larger valves operated by two springs found in the later Ambassadors). In fact, much remained similar to the earlier model. Right side shifter, tank, single speedometer housing, battery side covers, taillight assembly, and headlight bucket were all the same as components on the V700. It is speculated that the company was using up existing supplies as they tooled up for the new civilian Ambassador series, a practice that is still common in many companies today. New colors for the bikes (from the original red tank and gray fenders) were black, white or red, with white fenders. Pin striping was added as well. "The first Ambassadors were V7's, which were simply bored out versions of the V7 to 750cc. They have many of the same cycle parts as the V7 and really are mostly the same. Not many were made; they are rare. I have no access to frame numbers, etc. but I believe you have one of these." So what does this all mean to the world of Guzzi enthusiasts at large? Some may think that this "pre-production Ambassador" is merely a V700, with the components of that model and the engine and name of the Ambassador. However, I think this series is unique. It is neither a V700 nor a true Ambassador, and the company felt the need to identify this version with the "A", if only to distinguish it from the other two. At first look, one may not be able to tell the difference between these similar machines, but with only 5 "A-series" Ambassadors known to exist at this time, it truly is a "Rare Bird." Currently I am trying to create a list of the V700s, Ambassadors, and Eldorados that still exist today. Many have been parted out over the last thirty years and it is unknown how many remain. Moto Guzzi's success may have begun with its single-cylinder engine back in 1921. It was a true leader in its class during that time, with many races won and numerous records held. However, over the last 35 years, the continuing success of Guzzi has grown out of the rugged and reliable V Twin engine designed back in 1965. The basic engine design remains the same to this day and is unique to Moto Guzzi. It is difficult to know the future, but it can be assumed that if this legendary motorcycle company were to disappear, likely so would the V Twin engine for which it is so well known. If this were to happen, no doubt all Moto Guzzis would some day be identified as "Rare Birds."